I don't have anything to add to the long-running critical discussion for Notorious, one of Alfred Hitchcock's most beloved pictures, and one of the most thoroughly unpacked in narrative, thematic, and technical terms. But rewatching the film on its new Blu-Ray edition, I was struck by the film's subtlety, a word rarely thrown around when discussing Hitchcock, even by his admirers. Still, there's a delicateness to Notorious not normally seen in the master's work, visible not only in the nuanced performances submitted by the cast but also in the director's camerawork. Even the celebrated key scene, one of the definitive Hitchcock shots, is so playful and light that the tension it generates is even more effective because of its unexpectedness. The plot itself is, like so many Hitchcock thrillers, at once needlessly convoluted and forcibly direct: Alicia Huberman (Ingrid Bergman), the disgraced but blameless daughter of a convicted Nazi spy, is recruited by the American government to help expose her father's cohorts hiding in Brazil. But the nature of her assignment casts a dark shadow over the proceedings from the start, adding shades of moral complexity that threaten to makes the Americans look as perverse and inhuman as the Nazis themselves. Further complicating this moral and political ambiguity is its primary framing around a romantic story, personifying each side prodding Alicia with a single, lustful man, both of whom, in separate but linked ways, nearly kill her with their love. Hitchcock, known for his ice-queen roles for actresses, gives an inherent sympathy to Alicia from the start. 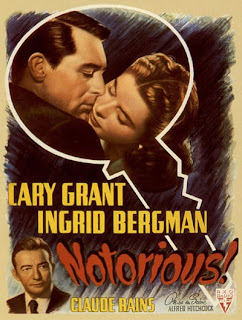 Opening, after a hilariously, uselessly specific title card (complete with date and time), at her father's sentencing, Notorious instantly places the woman under such scrutiny that it's impossible not to feel sorry for her. Hitch's camera might as well be one of the reporter's shoved up in her face as newsmen launch a barrage of questions that she quickly escapes. Without knowing anything about the nature of the trial, the sudden, harsh focus on a disheveled Bergman is unseemly, and Hitch knows it. This feeling of unease and seedy surveillance carries over into the next scene, a drink-to-forget party where Alicia boozes it up with pals. But there's a man with his back to the camera sitting in the foreground, looming over everything even when Alicia is standing in front him talking to another guest. The shadowy outline grows when the camera pushes in closer as all the guests seat themselves at roughly the same height, making this figure even more sinister and imposing. The camera finally pivots around to reveal Cary Grant, playing American agent T.R. Devlin. This is a hell of a way to introduce the ostensible hero of the story, and Grant wastes no time making his character every bit as vile as his visual introduction suggests. His clipped accent, which elsewhere made his comic timing all the funnier, makes his speech cold and cruel. When he finally strikes up a conversation with the well-intoxicated Alicia, his curtness is further emphasized against her light, slurred whispers. This wasn't Grant's first time undermining his image for the director. His role in Suspicion was so dark that the studio mandated a softer ending. But his performance here is almost worse; at least in Suspicion, Grant essentially plays the villain. Here, he's a loyal American seeking to rout some Nazis who escaped justice, so why does he give off such an eerie vibe? He gets Alicia out of a drunk driving arrest by flashing an unseen badge like a threat, and when Alicia comes to in a hangover, Hitchcock uses a woozy POV shot craning up and back to follow Devlin menacingly approaching her. Devlin even plays on Alicia's patriotism to force her into joining him, playing her tapes of her bugged house that prove her devotion to her country over her family. But somehow Grant turns even this into something twisted, making her exoneration inexplicably feel like blackmail. Grant and Bergman, so in control of their body language, communicate gulfs of conflicting emotions in these early scenes and beyond. Bergman's smile is weary and sad even at its most plastered, while Grant hides contempt and longing in equal measure behind his stoic gaze. He's so good at selectively revealing and suppressing these moods that it's as easy to buy Devlin's subsequent falling for Alicia as it is to instantly see him as a villain. Without the actors' fluid shifts in body acting and chemistry, in fact, the film falls apart almost instantly. The script moves too quickly and arbitrarily from this seedy introduction of Devlin and Alicia to the love that suddenly blossoms between them in Rio. Admittedly, they only seem to enter into a relationship to make the subsequent plot development emotionally affecting, but if sparks of mutual disgust and passion didn't fly between the leads, that twist wouldn't work. But, they do, and it does. Hitchcock applies the same delicacy to the revelation of the mission, a grim shock to Devlin as much as Alicia, as he does for the couple's dawning romance. Devlin, unaware how he and Alicia will infiltrate the Nazi ring in Rio, is called in by his superiors and told what Alicia is meant to do in ambiguously unambiguous terms. 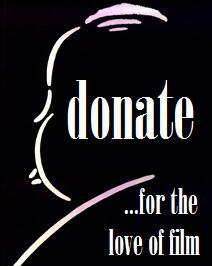 Alicia knows one of the spies, Alex Sebastian (Claude Rains), and the agents want her to play on his love for her. Devlin's bosses lingually circle around Alicia's wild past, obviously unable to come right out and call her a whore because of Production Code limitations. The elision makes the revelation that much worse, making it obvious what these men want of Alicia but not outright stating it. Likewise, the horrible understanding that dawns on Grant's face, and the equally roundabout way he tries to gently dissuade this course of action to no avail, is made heartbreaking for his inability to come right out and refuse. But that infuriating group of people who like to maintain that the Hays Code somehow made movies better by forcing them to be clever should take note of how Hitchcock deftly links Devlin's superiors with the censors who make their speech so euphemistic, or at least the moral character of such people. Devlin's repugnant behavior toward Alicia can be explained on a personal level, his desire for her so strong that he initially (and later) engages in regular shaming of her to bury his feelings. But his bosses have no real connection to Alicia, no knowledge of her other than what they compiled into a portfolio, yet they still pass judgment. Their callous remarks lack the bite with which Grant infuses his own, but their clinical remove in dictating this woman be a whore because they think she is one is, in a way, worse than Devlin's grotesque exhibition of affection. 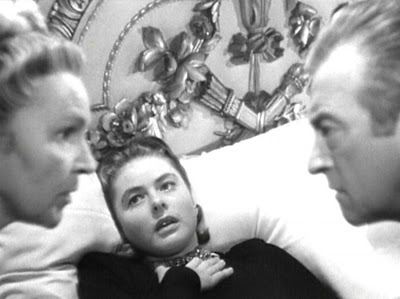 The rest of the film plays out mostly through facial expressions that convey suffocating air of personal betrayal. This can first be seen, obviously, in the next scene, where Devlin must explain to Alicia what it is she's meant to do for her country. The entire exchange is a masterclass of acting, Grant's verbal eggshell-walking utterly needless as Bergman's face flashes with understanding and pain the second Devlin asks if she remembers a fella named Sebastian. The couple then fragments as each looks to the other for a way out of this situation. Alicia asks Devlin if he stood up for her, and the briefest flicker of doubt and pain crosses Devlin's face as he sees an opening and then closes it out of duty. He will only say that the choice is hers. Alicia knows that it isn't, but Devlin needs her to agree so that he can hate her for her "decision" and bury his feelings again. Two people ruin their lives in a quest for self-absolution, and a perverse form of patriotism corrodes both of them. Hitchcock doesn't want for troubling scenes in his canon, but this one has always disturbed me most. It inverts the teasing sexual energy of their previous scene together, the famous Code-skirting kiss, the tantalizing back-and-forth of love played in reverse as the couple rends itself apart. Even when the film finally gets down to its thriller side, the suspense operates less on the Nazis' scheme of smuggling uranium (an almost laughably undercooked MacGuffin) than it does upon the gnarled love triangle between Devlin, Alicia, and Alex. Rains' casting, one last imposition on the director by David O. Selznick, was a masterstroke. Though significantly older than his co-leads, Rains' Alex projects a youthfulness and vigor at odds with the aged-beyond-their-years weariness of Alicia and Devlin. Where Grant hides Devlin's desires under hostile remove, Rains displays Alex's longing upfront. When Alex sits down with Alicia after an orchestrated reunion, he bluntly speaks of "the old hunger" returning, and Rains' face is soft with affection. As creepy as his forthrightness is, it's also refreshing compared to Grant's frosty condemnation, and Alex immediately establishes himself as more sympathetic than Devlin. Complicating Alex are two factors. First is his extreme (albeit ironically perceptive) jealousy, which leads him to quickly suspect Devlin and generates much of the film's tension. As Alicia and Devlin uncover more information about the Nazi circle to which he belongs, Alex carefully watches his lover and grills her over every encounter she has with the handsome American. The "key" scene, in which Alicia smuggles the key to Alex's mysteriously locked wine cellar to Devlin, is tense as much for the fear Alex will discover his new wife doesn't love him as it is he will discover she is an American agent. The second factor working on Alex is his mother. Leopoldine Konstantin, a veteran German actress, plays Madame Sebastian with more calculating venom than any other Hitchcock mother. She combines the emotional honesty of her son with Devlin's superiority and disgust, unreservedly making her disapproval of Alicia clear from the start. An insight into what Norma Bates might have been in life, Alex's mother mocks her son for falling in love, and his response that she just doesn't want him to love anyone but her emerges weak and docile, as if he could not stop the thought from spilling out of his head and stepped outside himself in a moment of stunned terror as he said the words. And when Alex eventually discovers Alicia's ruse and rushes to tell his mother, Konstantin receives his vague mention of something being wrong with Alicia with a joy she does not bother to disguise. And this is just when she thinks the woman is cheating on her boy; upon hearing the whole truth, she instantly hatches a plan to deal with this problem without alerting her son's zero-tolerance colleagues to his foolishness. "We are protected by the enormity of your stupidity, for a time," she says, the closest thing she has to consolation for her child's shattered heart. The final stretch compounds the layers of irony already at work on the film, with the audience learning of the plan to poison Alicia before she meets Devlin and receives her harshest tongue-lashing yet as he mistakes her sickness for a hangover and gloats over her falling off the wagon. Then, a worried outburst from both Alex and his mother when one of the other Nazis accidentally reaches for her coffee cup alerts Alicia to the truth of her illness as Devlin still mulls over the "drunken" sight of her at their last meeting. When he finally puts two and two together and moves to rescue her, the couple share a beautiful scene in which they finally speak to each other plainly about their feelings, placing the emotional content of the film on equal narrative footing to the thriller plot, which concludes right after with that chilling walk down the staircase as the Nazis silently, menacingly assemble in a manner not unlike the end of The Birds. Compared to the technical and psychological grandiosity of so much of Hitchcock's greatest work, Notorious is almost a whisper. Indeed, this is a film where emotional outbursts are what seal people's fate, whether it be the German metallurgist exclaiming over a uranium-filled bottle accidentally brought upstairs or Alex begging as Devlin speeds away with Alicia. Hitchcock's direction is no less technically impressive, nor as deftly manipulative, as his other work, but he makes the rare concession to his dream cast by letting them convey what is happening as much as his insert shots and emphasizing zooms. 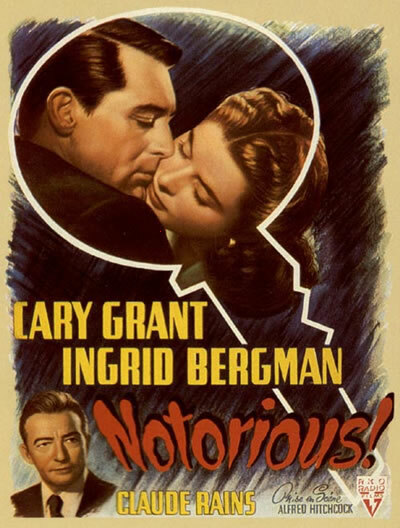 Notorious is, therefore, at once one of the director's lightest and darkest works, quiet in its delivery but thunderous in its implications.